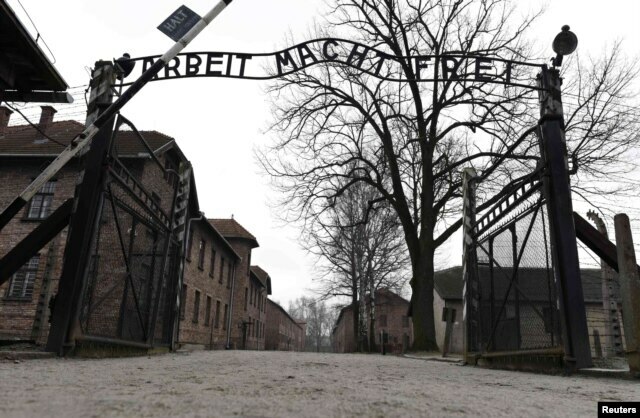 On January 27, 2015, delegations from 40 world countries will arrive in the Polish town of Oświęcim to participate in the ceremonies which will take place in the museum on the territory of the former German concentration camp, Auschwitz-Birkenau, in commemoration of the 70th anniversary of the liberation of this camp. The guests will include several heads of state (presidents and monarchs), prime ministers and notable politicians. However, the guests of honor will be the handful of concentration camp survivors who lived through the war until today. On the eve of the notable date, Russia initiated a resonant diplomatic scandal, which used the words of the Polish Minister of Foreign Affairs Grzegorz Schetyna said in an interview to Polish Radio on January 21, particularly, when he said that the death camp in Oświęcim was liberated by Ukrainians, the soldiers of the First Ukrainian Front, and they had been the ones to open the gates of the camp. In response, the Russian MFA accused Warsaw of blasphemy, cynicism and “historical vandalism,” as, they claim, the Soviet army had included representatives of many nations. The head of the Duma Committee for Foreign Affairs Alexey Pushkov stated that Ukrainians had freed Europe within the ranks of the Soviet army together with Russians, and the only person to distinguish them from the rest would be Schetyna. The official statements were supported with real hysterics in the pro-government Russian media (which constitute about 99 percent of the whole today), claiming that the Red Army had only included 16 percent of Ukrainians and two-thirds of it had been Russian. In response, Schetyna told Radio ZET that the tank which had torn down the gate of Auschwitz-Birkenau had been commandeered by Ukrainian Ihor Pobirchenko, and that the main goal of his previous statement had been to emphasize the fact that Russia irrevocably strives to reassign the victory over Nazism to isles, as the Russian Army had not included only Russians. The Russian press responded that the gate had been opened first by major Anatoly Shapiro whose battalion had been the first to enter the town of Oświęcim. Several Polish media outlets spoke out in unison with their Russian colleagues, accusing the Minister of libel. Whose side is the historical truth on? Camp Auschwitz-Birkenau is one of the complex of Nazi concentration camps which were united by the name Auschwitz, as well as their location. This complex was created upon orders of the SS Reichsführer Heinrich Himmler on May 20, 1940. The specialty of this camp was that it was set up as a conveyor belt to destroy “defective” peoples. In it, about one million Jews, 75 thousand Poles and 19 thousand Roma people had perished. In other camps of the complex, whose prisoners were used for various types of labor, the number of victims was much smaller, but just as frightening. For example, in the camp Auschwitz I, throughout its existence, over 70 thousand prisoners of war had perished, including Polish and Red Army soldiers. The prisoners included members of the Ukrainian National Liberation Movement, many of whom died there, such as the brothers of Stepan Bandera, Vasyl and Oleksandr. When on January 27, 1945, the Red Army occupied the concentration camps, 7600 prisoners had been inside. Over 58 thousand of the prisoners had been evacuated by the Nazis to their controlled territories, with the goal to continue using them for various types of labor, all surviving Ukrainian political prisoners were moved as well. The exact number of victims of Auschwitz is unknown, for various reasons, including the fact that in 1945 the entire archive of camp documents was moved to the USSR, made secret and located in the State Military Archives in the town of Podolsk near Moscow. These archive materials are secret and unavailable to researchers, they are yet to be examined. In the beginning of the 1990s Polish President Lech Wałęsa, based on the calculations made by the workers of the memorial museum, named the approximate number of victims who had perished in Auschwitz – 1,5 million people. Of course, not only the Ukrainians helped liberate the survivors of the concentration camp. However, it is very questionable that Major Shapiro’s infantry battalion had been able to outrun tanks in the advance; what is more, that the gate of the death camp could simply have been opened with human hands. On top of that, the heroic act of tank operator Ivan Pobirchenko, who became a renowned scientist after the war and died in 2012, was certified back in the Soviet days and officially acknowledged by both Ukraine and Poland. The most important thing is something else. The Russian media’s claim that there had been only 16 percent of Ukrainians among the soldiers of the Red Army, is not true, directly tied to the falsification of the number of those mobilized to the army and those who had died in the war; the scale of this falsification is not hundreds of thousands, not millions, but over ten millions of people. According to Ukraine’s Book of Memory, whose website was taken down during the reign of the Party of Regions, during World War II, within the ranks of various armies and military formations, millions of Ukrainians had perished. The absolute majority of the deceased fought for the Red Army and other Soviet formations (the fleet, partisans, NKVD troops etc). The objectivity of the data included in the Book does not pose a doubt if only because it was formed by hundreds of researchers from all of Ukraine in the times of Leonid Kuchma’s far-from-‘nationalist’ reign, and the head of the editorial committee of the Book was member of the Communist Party Ivan Herasimov. However, Kuchma’s father died on the front, and tank operator Herasimov fought since the very first days of the war, which was why both were personally interested in accurate data; in addition, General Herasimov’s honor took precedence over the ‘guidance’ from Russia and fellow party members, that they were providing numbers of Ukrainian losses that were too high as compared to the official numbers of about 1,8 million of the 8,7 million of personnel lost. In reality, there were more than 16 percent of Ukrainians in the Red Army (this is the minimal number taken from the end of 1942, and in 1944, say, they constituted one-third of the entire Red Army), and the losses were much greater – also thanks to the soldiers that were taken from the ‘free’ territories and sent to storm German positions without service weapons or having been recorded into the unit’s personnel list. The number of those in Ukraine, according to calculations, exceeds a million people. By the way, the Polish Minister, saying that only 1-1,2 million Ukrainian people had been in the Russian Army, also fell victim to Moscow’s propaganda. There is another number I cannot forego mentioning here. The soldiers of the Red Army died not only at the hands of their enemies. Throughout the war, according to the data published in 2005 by the Russian President’s Committee headed by Alexandr Yakovlev, about 954 thousand Soviet soldiers had been killed by their own including the NKVD, secret troops, SMERSH, military tribunals, and commisars. This frightening number characterizes the regime that brought ‘liberation’ to the people of Europe accurately. Making the number public became the last heroic act of the combat officer, and later academic and ideologist of the perestroika, Yakovlev. So it is no surprise that between fall of 1945 and the end of 1949, some of the Auschwitz camps were used as prisons of the Soviet NKVD and the Ministry for Public Security in Communist Poland. The same way as, say, Buchenwald on the territory of Germany was. Not only Nazis and their accomplices but also the ‘incorrect’ fighters of the Resistance, both Polish and German, those who did not bow down to Stalin’s regime, ended up behind bars in those camps.